Then I Got To Thinking...: Super Bowl Sunday! Looks like an awesome party! Can't believe you ran a 10k and hosted a party all in the same day. You rock!!! BTW, I can't run a mile...much less 6 so I think that is pretty amazing. oh honey! WAY TO GO! proud of you!!!!! i love food. now i am hungry and it's your fault. ha. Congrats on running the 10K! I'm very impressed as I hate running with a passion. I want to like it! I just don't. :( Your Super Bowl party looks amazing too! Sounds like a fun weekend! Congrats! That is awesome time you made!! And your Superbowl party look so fun! i would have LOVED to have gone to your super bowl party! The superbowl party looks so fun! And go you for running the 6.2 miles before -- it probably made you feel not guilty to eat all the yummy snacks on Superbowl Sunday! That looks like one hell of a rocking party. Congrats on the run and that puppy is *so* cutie. 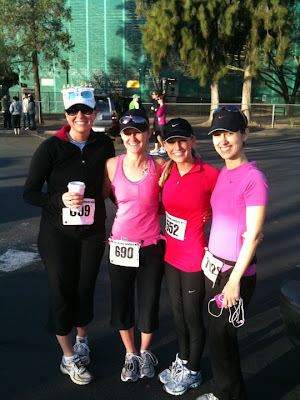 i want to run a marathon...no motivation though so probably wont ever happen. way to go on your run!!!!!!!!!!! How fun!! 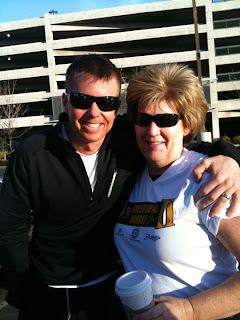 You're amazing with all your running... And what a fun party!! That last photo is simply ADORABLE! Girl, way to go on the race! You rocked it! 55 minutes?! That's AWESOME in my book! Way to go!!!! wow 6 miles?! you go girl! It looks like a great Super Bowl party!!! I wish I could have thrown one, but it was my little brother's 16th birthday so I had to deal with that! But next year, ohhh yeah, i'm going big for Super Bowl! Congrats on your 10K!! That is a great time!! Congrats on the awesome pace and the successful party! Your home (what I can see of it anyway) is gorgeous! 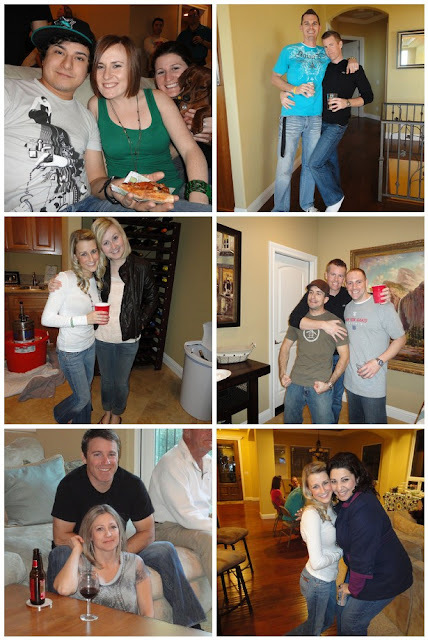 Oh wow, look at you hosting a party after running so early that day! Everything looks great. What a great party Tracy and love your flower vase! Bravo on the run! Looks like you had a wonderful party, I am so sad we missed it! You are quite the little hostess! Everyone looks so happy! Tracy, congrats on the race! I'm so excited for you - that is such a good time! :) And how sweet that TL met you halfway - so cute! Seriously, Costco or not, you are a great hostess. Everyone in all the pictures look like they're having such a great time - so congrats on the party! And I'm a firm believer that mason jars make everything more fun - there's a restaurant kind of near me called "The Mason Jar," and all the drinks are in mason jars.. I can't explain why, but it makes me so happy! That looks like quite the party!! Fun! & btw, You are gorgeous! hey lady, are you going to claim your win or what? you forget to read my entire post on friday and totally missed the fact that you won my shopbop giveaway. LUCKY! so hurry up and send me your info before the end of the week. good for you running on super bowl morning! The pics look so fun! Looks like you guys had a blast! 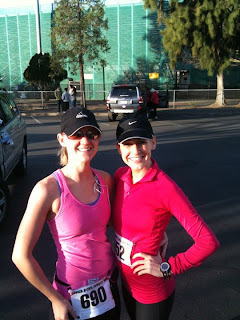 Congrats on running your marathon, I'm doing my FIRST EVER in April!! EEK! Any tips? Just came across your blog! Cute!! I love how you dressed up the food table for the super bowl party! I would do that!!! 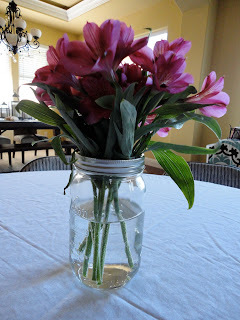 I also love the flowers in a mason jar...my best friend is doing that all over for her wedding!!!! Wow! What a busy day! That's a whole lot of activities :) good for you with your run! That time sounds incredible to me. I am not a runner. I wish i was but it's so intimidating. Looks like your party was a hit, too! holy crap! My superbowl would have been so much better had I run 6 miles earlier in the day! 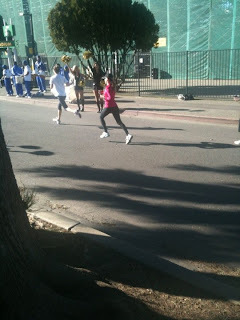 :) That's awesome good for you and I know, it's amazing at races how talented runners are. I once saw a guy who was about 92 finishing a 10k. Looks like a great super bowl party!! Congratulations on running the race. Sound like your Super Bowl Sunday was awesome! That's a great time on your run!!! Impressive! Looks like such a fun party. That last picture of you two is precious! What a great looking party!! "The pups were lap hopping" I love it! Mine were stuck to me like glue (in hopes that I would protect them from the stranglehold of the little kids). Congrats on the 10K! I bet that made it easier to induldge in the Super Bowl calories. Good work girl, I knew you could do it! I hope someday my leg injury heals up so I can go running again - I miss it so much! :) Looks like you had a great celebration afterwords as well, well done!